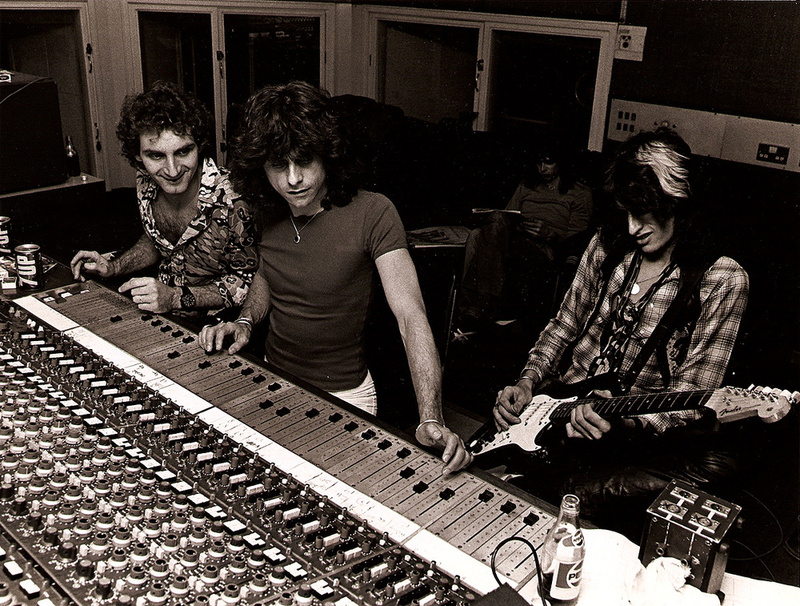 Recording Aerosmith. 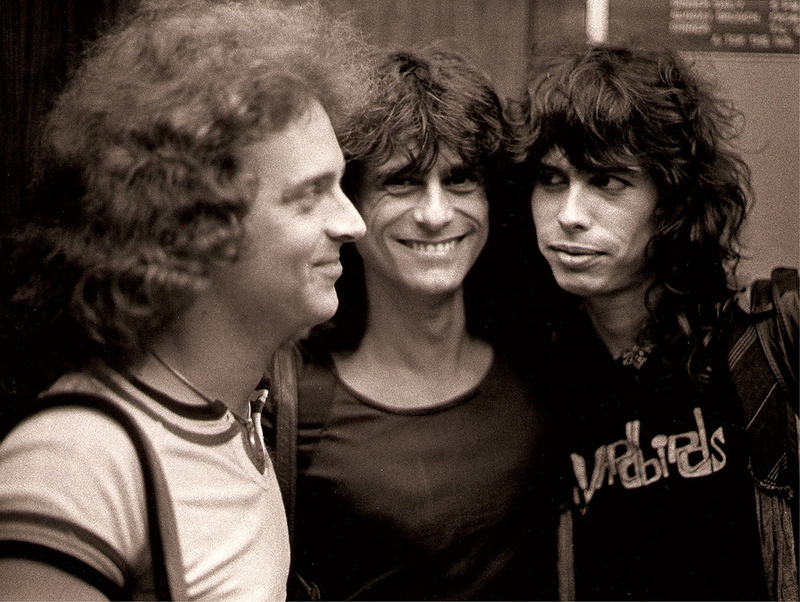 From left to right: Jack Douglas, Jay Messina and Joe Perry. The raunchiness of the Rolling Stones, the sleaze of the New York Dolls, the blues‑boogie riffing of Led Zeppelin — this was Aerosmith in the mid‑'70s. The group's loose and stripped‑down brand of heavy metal, combined with pioneering power ballads that blended piano and strings with distorted guitars, was a potent cocktail. 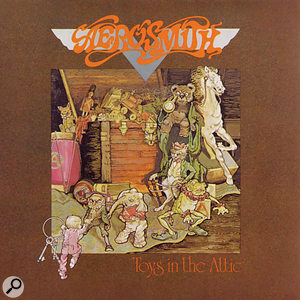 Forget the pretensions of progressive rock or the morbid musical mysticism that was then in vogue among many of Aerosmith's contemporaries: on their third album, Toys In The Attic, they hit the ground running with straightforward, yet expertly crafted rock & roll, sexually‑charged lyrics and a streetwise swagger that, while placing them on a par with the Stones, confirmed that these guys had plenty of talent and allure in their own right. Jay Messina with joey Kramer (left) and Steven Tyler (right). Formed in 1970, the Boston‑based outfit's genesis lay in the quintet of vocalist Steven Tyler, lead guitarist Joe Perry, rhythm guitarist Ray Tabano, bass player Tom Hamilton and drummer Joey Kramer. However, it was only after Tabano had been replaced by Brad Whitford and a contract had been secured with Columbia Records that the band set about recording their eponymous debut album. Released in the fall of 1973, this spawned a minor hit in the form of 'Dream On'. 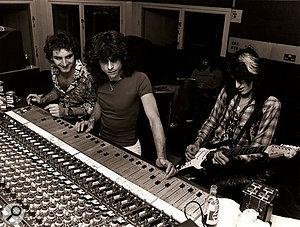 Thanks to a non‑stop schedule of US concert appearances, as well as the behind‑the‑board additions of producer Jack Douglas and engineer Jay Messina for the multi‑platinum 1974 album Get Your Wings, Aerosmith built their reputation along with their fan base. Nevertheless, it was Toys In The Attic, released in April 1975, which projected the group into the mainstream and cemented their superstar status with fans and critics alike. The album's first single, 'Sweet Emotion', climbed to 36 on the Billboard Hot 100 in the summer of '75, followed by the album itself reaching number 11 and a re‑release of 'Dream On' making number six in early 1976. 'Walk This Way' — which failed to chart following its initial August '75 release — was also reissued in November 1976 and peaked at number 10. Encapsulating all that Aerosmith represented at this point, in terms of their music and their attitude, the song has a hard‑hitting sound, a sleazily suggestive riff, and equally sordid trash‑talk lyrics about high-schoolers losing their virginity. Not only was Steven Tyler's neo‑rap style of vocal delivery way ahead of its time, but between Joey Kramer's two‑measure drumbeat intro and Joe Perry's instantly identifiable guitar hook, Aerosmith had their anthem. And while the music was written before the words, that song's title was derived from a weather‑worn gag in the Mel Brooks movie Young Frankenstein. Igor (Marty Feldman) directs his master to follow him by telling him to "walk this way”, and the good doctor responds by reluctantly adopting his servant's hunched posture and using his short cane. Jack Douglas and Jay Messina recording a Joe Perry guitar part while Steven Tyler does the crossword. 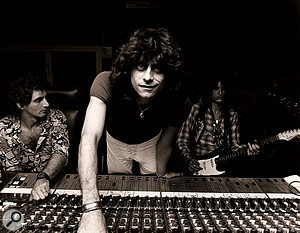 An engineer with a list of credits that includes Kiss, Yoko Ono, Lou Reed, Miles Davis, Supertramp, Slash, Patti Smith, Peter Frampton and five studio albums with Aerosmith, Messina is a native New Yorker who played vibes in high school bands before studying electronics at the RCA Institute. 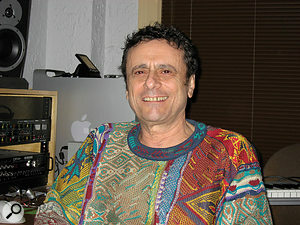 His first job, in 1965, was at the small yet state‑of‑the‑art midtown Manhattan studio of jazz musician Don Elliot. This housed one of Les Paul's original eight‑track tape machines, and Messina's initial session there as an assistant was for some Ravi Shankar movie soundtrack work that was being funded by a doctor: one Dr Timothy Leary, the soon‑to‑be LSD guru who would urge a generation to "turn on, tune in and drop out”. It was, to say the least, a colourful introduction to the recording business, and during the next year and a half Messina familiarised himself with — and took care of — all aspects of Don Elliot's facility, ranging from mag transfers to setting up the equipment. Then, an introduction to Phil Ramone resulted in Messina being hired at Ramone's facility, A&R Recording, where he started out cutting lacqueurs on a Neumann lathe before graduating to radio editing work and, on the weekends, recording bands direct to two‑track. This, in turn, led to jingle work and, eventually, his first fully‑fledged engineering assignments. It had been a long apprenticeship, but a comprehensive one, and he had more than enough opportunities to test his acquired skills after being hired by Chris Stone to work at the Record Plant in the early '70s. Jay Messina in his home studio today. Among the assistants with whom Messina initially worked at the Record Plant was one Jack Douglas. The pair quickly hit it off. Still, didn't it feel strange for Jay Messina to have a guy who had only recently been his studio assistant now calling the shots as the producer? 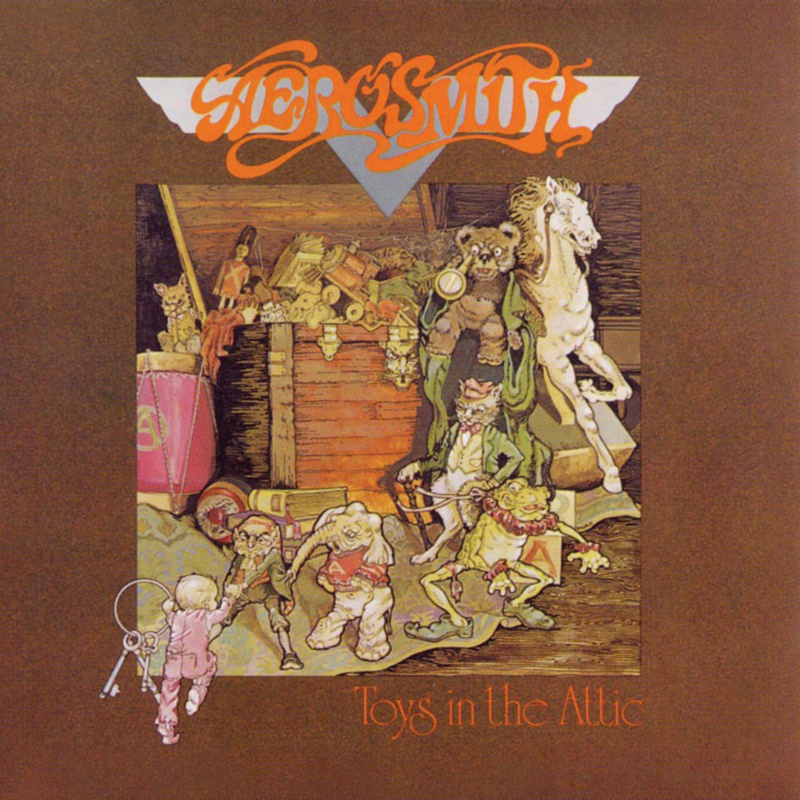 As for Aerosmith, they, too, were involved in the production process, especially Steven Tyler and Joe Perry, who would increase their participation in this regard as the years progressed (and, in 1986, also turbo‑boost their group's then‑flagging fortunes by guest starring on Run‑DMC's landmark rap‑metal cover version of 'Walk This Way'). For the second album on which the aforementioned parties collaborated, 1975's Toys In The Attic, the sessions mostly took place in the Record Plant's Studio A, where the control room housed an old 30‑input Spectrasonics console, Westlake monitors, an Ampex quarter‑inch tape machine and a modified MCI 16‑track, two‑inch machine. While the Record Plant engineers had access to EMT 140 plates, Meyer and Fairchild compressors, Universal Audio Teletronix LA2As, Urei LA4s, Urei 1176s, an Eventide phaser and flanger, and Pultec EQ, the effects employed on Toys In The Attic included the kind of compression‑and‑distortion‑embellished tape delay that today's plug‑ins don't provide, as well as backwards reverb and, on 'Sweet Emotion', backwards handclaps following the first chorus. "A lot of the time we would print the effects direct to tape,” Messina recalls. "Several years ago, Jack and I did a 5.1 mix of Toys In The Attic, and when I transferred the 16‑track tape to Pro Tools after going through a bunch of A‑D converters to find the right one, I found that, on almost every tune, there was an open track. Back then, we'd always leave an open track for that last idea that somebody might have, and on only a few of the album's tunes was everything filled up. While effects were printed directly on some of the vocals, the drums usually had a track for the kick, another for the snare, a stereo pair, and a Sennheiser 405 shotgun mic pointing directly down at the snare, compressed with a [Urei] 1176 and printed on a separate track. Just putting a little of that in the mix would add a nice roomy quality to the drums. "On the stereo pair that had the hi‑hat, the cymbals and the toms, there was a return of some guitar effects that we probably printed as we recorded the tracks. In fact, since we wanted to print a stereo effects return to some of the guitars, on one song we may have even bounced some of the drum tracks so that the returns of those guitar effects were included on the tracks. It was really all about making a decision at some point that these effects were going to be there, and, unlike a lot of today's Pro Tools techniques, you could have three mics on a particular guitar and each mic going to a separate track. Looking through the Studio A control room window from behind the desk, the live area during the Toys In The Attic sessions sometimes featured Joey Kramer's kit on a section of wood flooring on the other side of the glass, adjacent to the guitarists. At other times — such as during the recording of 'Sweet Emotion' — the drums were in a booth on the right‑hand side, in a more dead‑sounding part of the room. "We didn't isolate every single thing,” Messina says. "A lot of the time, when the kit was on the wood in front of the glass, there was leakage from the guitars going into the overhead mics on the drums, and those drum mics created a special sound for the guitars that we wouldn't otherwise have got. In most cases we were recording the guitars on one track, meaning it was a mono source, but the leakage into other mics gave them some size and some stereo. "When the drums were out of the booth, there was more height to deal with, so I was able to point the shotgun mic straight down at the snare. However, when they were in the booth, to get a more dead sound, I didn't have the height to use the 405 and so I'd use a room mic instead. In both cases, I'd often use [Neumann] 87s on the toms, and just one [Shure] 57 on top of the snare — unlike today, when lots of times I'll use three mics on a snare. Or there'd be an Altec saltshaker if we wanted maybe a little more edge. Then, for the kick, we'd often use an Electrovoice 666 pretty much inside the drum, while there'd be 87s for overheads. "It got progressively deader as you moved towards the back of the room, and Tom Hamilton played bass back there, just beyond the drum booth, with a little gobo around his Ampeg B15 so that there wasn't an unmanageable amount of leakage. The B15 was generally miked with an [EV] RE20 and combined with a DI that came right off the head of that amp, and it was usually in the room because there was only one real vocal booth while another booth was used for the piano. "Steven mostly sang along with the band for the basic tracks, and he was often miked with an 87 and set up with speakers; maybe a couple of Yamaha NS10s, although I'm not a hundred percent sure about that. A trick I learned from doing jingles was to put the speakers out of phase while the mic was at the cancellation point of those two speakers, and this allowed to Steven to sing without using headphones and, therefore, with a little more energy and the vibe of being with the band. In fact, in many cases we'd use the Sennheiser 405 on him because, since it had a lot of edge and was very directional, it was very conducive to that technique of using speakers that were out of phase. "The guys were all positioned in a circle so they could see each other, and when the guitarists were on the wooded floor with their backs to the control room glass they'd stand next to their amps. We would use a combination of a 57, [an AKG] 421 and a Sony C37 for each of them, and between the meat of the Sony and the edge of the 57 and the 421, we could get a pretty good variety of choices, whether we were miking just one speaker or, say, using the 57 on a second speaker. We might add limiting or phasing or flanging to that, but lots of times we'd just get a mix that we liked and print it that way. I mean, the true sound of any instrument is how it sounds in the room, and those guys had their own sounds, thanks to how they played, the guitars they were playing and how these were recorded at the amp. In the case of Steven Tyler, after performing with the band, his Toys In The Attic vocals — overdubbed within a gobo'd section in Studio A's wooded live area — were usually comped, but not nearly as much as many of today's digital recordings that play around with syllables, let alone words. "It's not that you couldn't do it back then, but it wasn't easily done, and it also wasn't necessary with those who had the talent to sing,” says Messina. "Steven did — and does — have talent, and so there was no need to get in there with a microscope and pick it apart. He would just come up with great vocals. Usually stretching from the early afternoon to the wee small hours of the morning, the Toys In The Attic sessions took place six days a week — and sometimes seven days a week — during January and February of 1975, with at least one day allocated to each of the mixes. "We never shied away from extra hands,” says Messina, who currently does a lot of mix and mastering work in his Pro Tools‑based home setup, which combines digital technology with plenty of analogue gear. "Lots of times we'd use the assistant or even a band member when there was a switch to make or a fader to ride. And even though we spent roughly a day on each mix, sometimes we would do a section of a song, make whatever changes were required — or, if we got a piece right, have that on our quarter‑inch — and then edit the mix together so that it flowed. The only reason it didn't take longer was because we were working 16‑track, and by making decisions as we went along during the recording process and ensuring it sounded good every step of the way, it made the mix that much easier. "In fact, when we did the 5.1 remix, I really got to appreciate how great 16‑track sounds. When 24‑track came in, 16‑track kinda went out the window, but having more space for your information definitely had its benefits, as did the spontaneity of the recording process when you had to make decisions as you went along. For me, that's where the magic happens, and while Pro Tools has great advantages and I certainly don't miss razor‑blade editing, what I still really enjoy is doing live‑to‑two‑track records — mostly jazz sessions — because there's that kind of excitement in the music and in the sound that has gone away with today's dissected form of recordings. 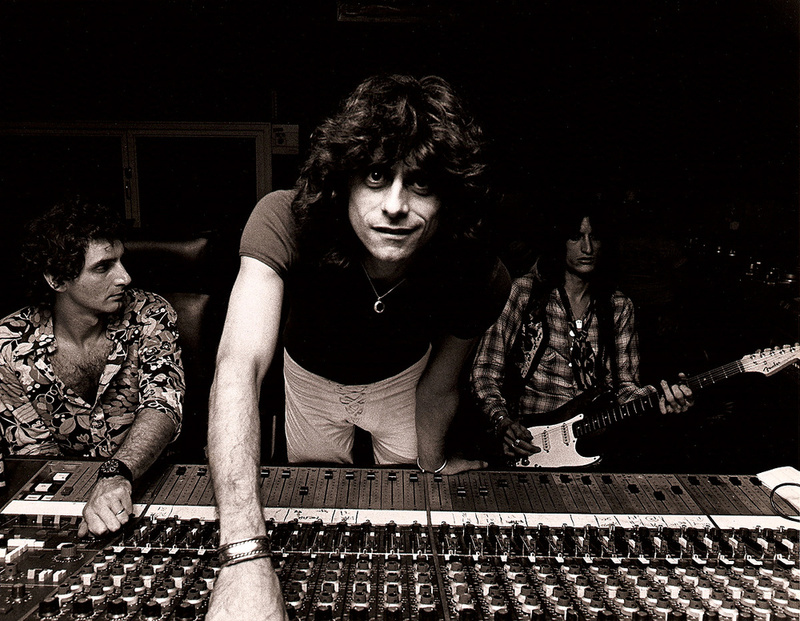 As it happens, although Perry's solo for 'Walk This Way' was recorded in Studio A, the rest of that track was captured in the Record Plant's Studio C. Located on the 10th floor, this housed a Datamix console, an MCI 16‑track, two‑inch machine and yet more Tom Hidley‑designed Westlake speakers, alongside a live room that differed from Studio A in that as there was no wooden floor, the sound was extremely dead, and the drum booth was positioned alongside the rear wall. While Hamilton's bass amp was in an air lock just outside the studio's back door, he stood to the left of Kramer's kit, with the guitarists near the control room glass and gobos around them. Sample 'Train Kept A‑Rollin'', the Tiny Bradshaw staple that has been covered down the years by outfits such as the Yardbirds, Led Zeppelin, Metallica, Motörhead, Skid Row, the Tragically Hip and Twisted Sister. As recorded by Aerosmith, and released as the second single off the Get Your Wings album, it segues from a dry‑sounding studio session to a 'live performance', simulated in the aforementioned hallway and embellished with crowd noises.